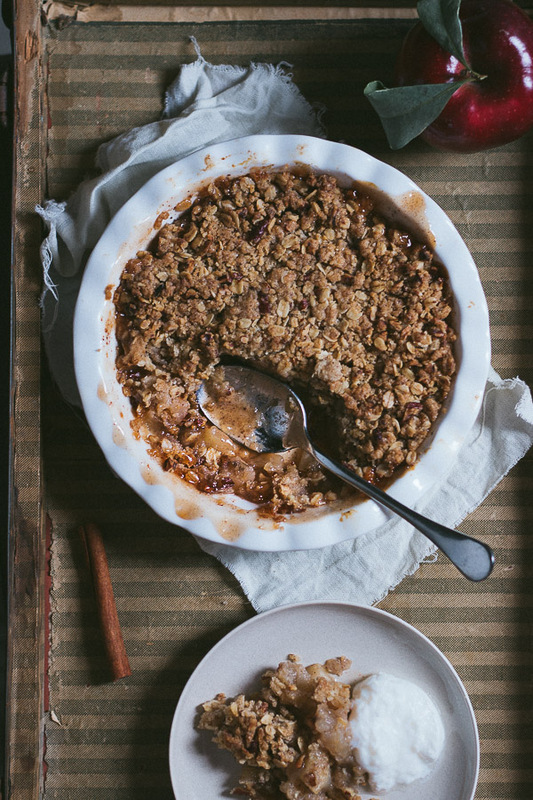 The Ultimate Apple Crumble Recipe | Pretty. Simple. Sweet. 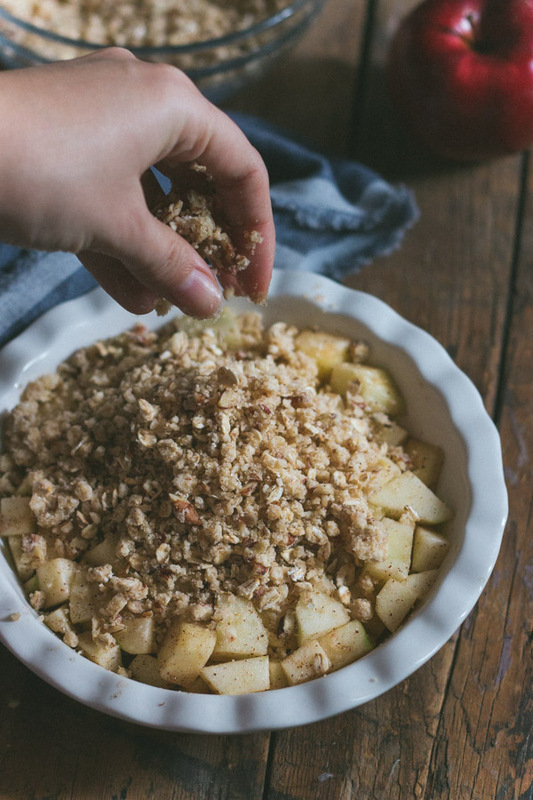 This is my favorite apple crumble recipe – sweet and tender apples topped with a crispy, crumbly, nutty streusel. The smell as it bakes is divine! Yesterday wasn’t a great day for me. The day started with a storm, followed by a phone call from a friend suggesting we go on a little hike. For some odd reason, we thought it was a great idea but it seems we were the only ones because once we got there we realized there was not a single other soul on the usually-popular trail we took. Also, I forgot my apple crumble dish back at home, and was so upset about it, but as the day marched on, that turned to be the least of my problems. While the hike itself was nice (cold and somehow pointless, but still nice), once it started getting dark, we headed back home. That’s when the real adventure began. We came across a huge puddle that our little Mini Cooper couldn’t possibly pass through without getting stuck in the mud, so with no real choice left, we decided to try a different route. The next 3 hours were spent in complete darkness, driving 10 km/h and keeping Google Maps close to our hearts while dozen of routes brought us to blocked roads, puddles, rivers, and cattle that wouldn’t let us pass through. The wonders of nature! We really started panicking when we realized there was just one long route left for us to try. Desperate, we were up for the challenge. Now, remember the first puddle we bumped into? After 30 minutes of driving, we got to that exact same point again. With not a single option left, we took a leap of faith and drove full force into it, and… we made it through! This was a time to either laugh or cry. They all laughed. I cried. The story has a happy ending though. The only comforting thing at that point was knowing that something good was waiting for me at home – warm and juicy apple crumble. The idea of forgetting something behind never felt so good. I finished half of the crumble by myself, and then slept like a baby. One of my favorite fruit desserts on this planet is apple pie, but as a quick and simple version of it, I make a crumble or crisp. Tender, juicy, sweet apples, with a crispy, nutty topping fills my heart with joy! 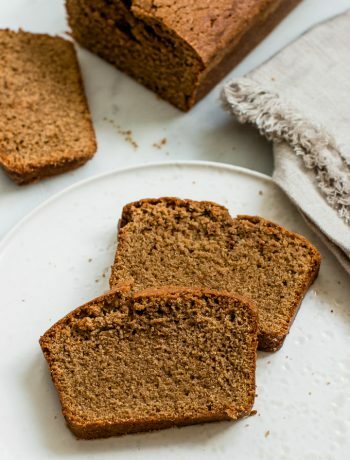 If you want to learn more about the best apples for baking, check out this apple bread post. The apples should be tender but not mushy, and you can cut them in slightly different sizes for different textures. The streusel topping is the best part in my opinion, and you can always make more of it if you prefer more topping (and I’m totally with you on that), although I think that the ratio of apples to streusel is perfect in this recipe. While the streusel can be made from just a simple mixture of flour, butter, and sugar, I usually like to add oats and nuts for more flavor and crispiness. You can leave both of them out and multiply the other streusel ingredients by 1.5. Preheat oven to 350F/180C. Lightly grease a 9-inch round or an 8-inch square baking dish. Set aside. 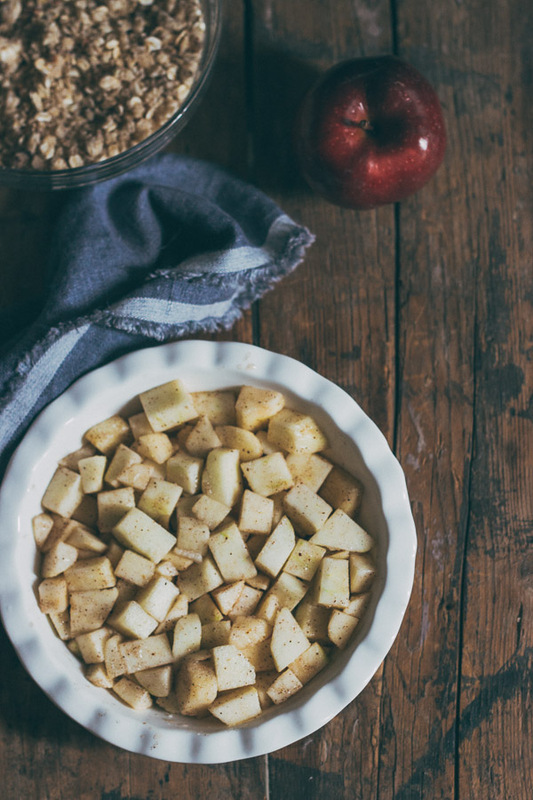 Make the apple filling: In a medium bowl, toss apples with lemon juice. Add all other ingredients and toss evenly to coat. Transfer mixture to prepared baking dish and spread evenly. Set aside. 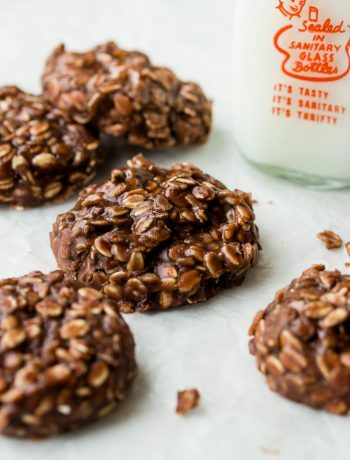 Make the topping: Place all ingredients except for oats and nuts in a food processor and pulse until mixture clumps together into crumbly balls. Sprinkle oats and nuts over mixture and pulse 2-3 times to combine. Alternately, you can crumble the ingredients in a bowl using a pastry cutter or a fork. Sprinkle crumble evenly on top of the filling. Bake for 30-40 minutes, until topping is golden brown and juices are bubbling. The apples should be tender when a toothpick is inserted, but not mushy. If the top is browning too fast, cover loosely with aluminum foil. 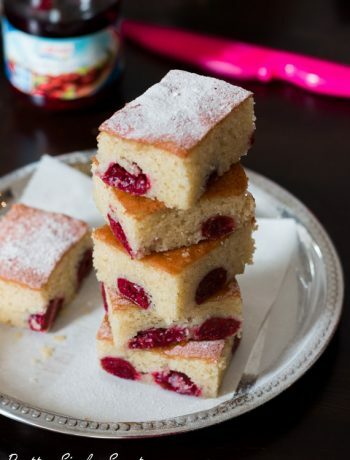 Allow to cool for a few minutes on a wire rack until warm. Serve warm and, if you like, add ice cream or whipped cream. Crumble will keep, covered, in the fridge for up to 3 days, but will taste best and be crispier on the first day it’s made. After that, it will slowly become soggier. Homemade pastries are the best, your crumble looks delicious! I agree! Thank you Laurence! טוב, אין מה לעשות, זה הקינוח מס 1 אצלי במשפחה. Exactly! So simple and delicious! Hi Rachel, you can, but the apples will probably get brown. 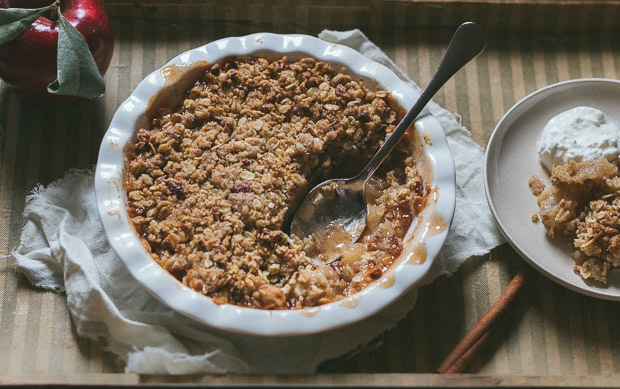 What I suggest is to make the apple filling, place it in the pan, and partially bake it, without the crumble topping. Pre-cooking the apples will keep them from turning brown. Then keep both the pre-cooked apple mixture and the topping separately in the fridge. Before baking and serving, sprinkle the topping on top of the apples, and bake until apples are soft and topping is golden brown.